This entry is concerned with the availability of artificial light. If you live, or have lived, at a place where there is no artificial light available you know how important it is. Once the sun is down you cannot get any work done and reading a book is also not an alternative. The history of light is a history of technological innovations in the technologies that are available – including candles, lamps, and light bulbs – the energy sources that are available, and the institutions that make these technologies possible. It is a prime example for the benefits of technological innovation and the study of socio-economic change over the long run. Historical studies have focussed on the UK in particular and this is therefore also true in this entry. The price of light declined dramatically and what was once a technology that was only available to a very small elite is increasingly available to poorer households across the world. Over the course of the 20th century light bulbs, powered by electricity, became the standard. And if you miss the warm light and coziness of a candle, you can still light a candle today. To calculate the price of lighting – today or historically – two different prices need to be known: first, the prices of the relevant energy sources and second, how efficiently the available technology at the time can turn the energy into light. The latter is referred to as the &apos;lighting technology efficiency&apos; in the literature and is measured in units of energy used for each lumen-hour of light generated. The visualization below shows the effect that innovation in technology and falling prices of energy had on the price of light in the UK. In 2006 the price of 1 million lumen-hours of artificial light was £2.89. 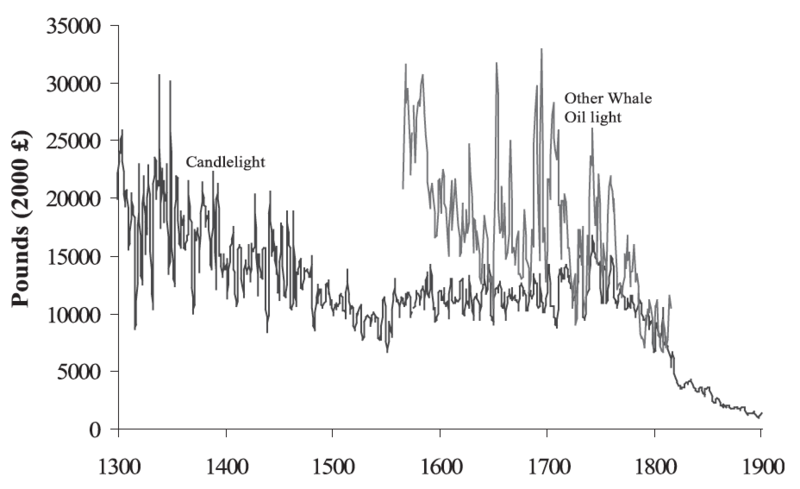 In the 14th century the price for this same luminous energy – adjusted for inflation – was around £35,000. A 12,000-fold decline of the price of a truly important service. Tallow candles: Tallow candles were produced from the fat of beef or mutton and from the 14th to the 18th century tallow candles were the available source of artificial light. Compared to the very low income of people at that time the price of candles was high and this meant that candles were unaffordable for most and therefore, as the authors put it, "most people lived in near-complete darkness". The old expression "The game isn&apos;t worth the candle" gives insight to a time when the cost of artificial light was a big concern. Kerosene: Kerosene, also known as paraffin, is made from petroleum. Lamps that could burn kerosene became available in the 1860s in the UK and were cheaper than candles as soon as they became available. The lamps that could burn kerosene were also cheaper than gas lamps and in contrast to gas they did not require the high costs of installing pipes. For that reason this technology particularly benefitted the poorer households. in the 1880s the &apos;lighting technology&apos; changed again substantially. Electricity now began to compete with gas and kerosene in the market for lighting. The dominance of electricity was however not established over night and only in the 1920s did electric lighting became cheaper than gas lighting. Since then electricity is the dominant source of energy for lighting in the UK. Compact fluorescent light bulbs: Over the course of the 20th century the incandescent light bulb and lighting efficiency changed only very little. 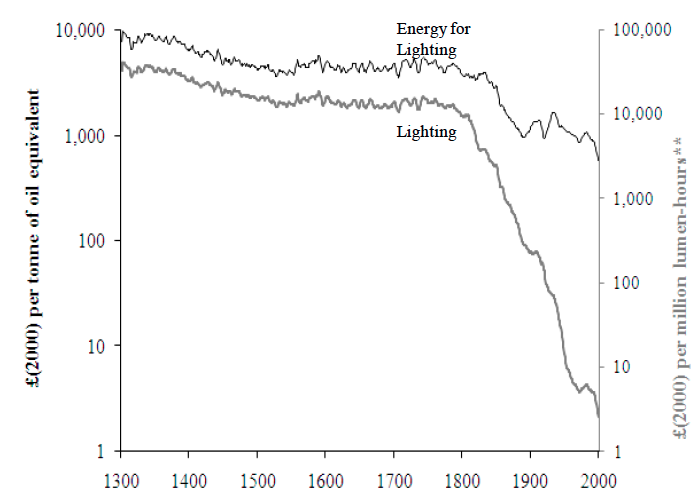 The decline of the price of lighting in this period was driven by a decline of the price of electricity. This period of relative stagnation in lighting technology came to an end with the introduction of compact fluorescent lights (CFLs) which are five-times more efficient than incandescent bulbs. These developments made it possible that the per-capita consumption of lighting was 11,800-times smaller in 1800 than two centuries later (from 1,100 lumen-hours of artificial lighting per capita in 1800 to 13,000,000 lumen-hours in 2000). 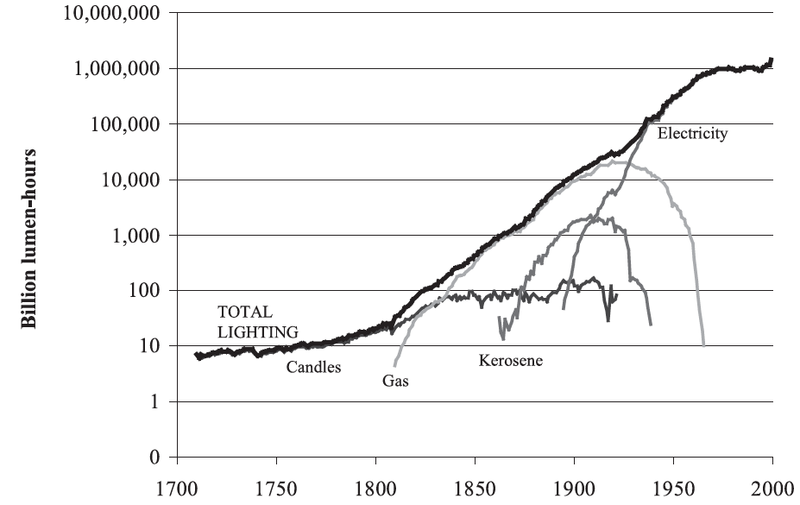 The visualization below shows the total consumption of lighting from the 18th century to today. The total consumption increased more than 100,000-fold over these three centuries in the UK. Shown is also which technologies, discussed above, became available at different times. Christopher Small & Christopher D. Elvidge (2013) – Night on Earth: Mapping decadal changes of anthropogenic night light in Asia. International Journal of Applied Earth Observation and Geoinformation. Volume 22, June 2013, Pages 40–52. Online here. Henderson, Storeygard, and Weil (2011) – “Measuring Economic Growth from Outer Space,” American Economic Review, 102(2), 994-1028. This paper is online here. Chen and Nordhaus (2011) – “Using Luminosity Data as a Proxy for Economic Statistics,” Proceeedings of the National Academy of Sciences, 108(21), 8589—8594. Tilottama Ghosh, Rebecca L. Powell, Christopher D. Elvidge, Kimberly E. Baugh, Paul C. Sutton and Sharolyn Anderson (2010) – Shedding Light on the Global Distribution of Economic Activity. The Open Geography Journal, 2010, 3, 147-160 147. 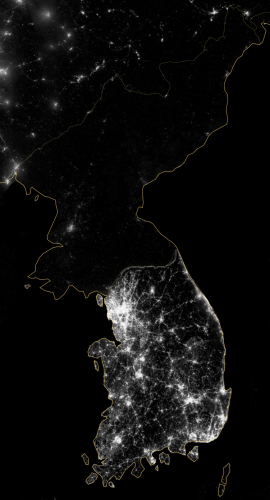 Striking is the difference between North and South Korea by night shown in the satellite image below. It illustrates the point about the correlation between night time light and living conditions in terms of health, food provision, and poverty. Fouquet and Pearson: "One million lumen-hours is roughly equivalent to having a 100-watt incandescent bulb lit for 100 hours. NASA&apos;s Visible Earth catalog, online here, is a great source for night images of the earth. Fouquet, Roger and Pearson, Peter (2012) The long run demand for lighting: elasticities and rebound effects in different phases of economic development. Economics of Energy and Environmental Policy, 1 (1). pp. 83-100. ISSN 2160-5882. Available via the LSE's website here. As the United Kingdom did not exist in the early period of this time frame the authors write they are "focussing on the experience in what became the United Kingdom". These sources were published in Beveridge (1926). And Rogers (1865–86) published prices in market towns across England. Beveridge,W. (1894) – Prices and Wages in England: From the Twelfth to the Nineteenth Century. London: Longmans, Green and Co.
Rogers J.E.T. (1865, 1882, 1886) – A History of Agriculture and Prices in England. Vol I-VI. Oxford: Clarendon Press. Efficiency is measured in terms of producing light – measured in lumen-hours – per unit of energy. And thereby also the cost of insurance. This is taken from Fouquet and Pearson (2007) – Seven Centuries of Energy Services. The Energy Journal, Vol. 27 (1). This is taken from Fouquet and Pearson (2012) – The long run demand for lighting: elasticities and rebound effects in different phases of economic development. Economics of Energy and Environmental Policy, v.1, pp.83-100. The source is Fouquet and Pearson (2007) – Seven Centuries of Energy Services. The Energy Journal, Vol. 27 (1). Fouquet and Pearson write: "Until the mid-nineteenth century, income elasticities were about 0.7 and price elasticities about 1.2. This latter value suggests that during this period, the rebound effect was large enough to imply backfire: energy efficiency improvements led to increases in energy used for lighting. Then, between the 1840s and the 1890s income and price elasticities increased dramatically. A 10% price decrease or 10% efficiency improvement led to 17% more lighting consumption, substantially increasing energy consumption. Even more impressively, a 10% increase in per capita income appeared to generate 35% more lighting use and, all other things being constant, energy requirements. Between 1900 and 1950, income elasticity fell to unity, before dropping to between 0.25 and 0.4 at the beginning of the twenty-first century. Throughout the twentieth century, price elasticity and the rebound effect have ranged between 0.5 and 0.7, showing considerable stability." The composite satellite image below shows the earth at night. It shows that richer and more densely populated parts of the world are lit up brightly at night. This composite image is produced by NASA. The source of this image is Bejamin Hennig's Views Of The World here. This is a composite image of the earth at night assembled from data acquired by the Suomi National Polar-orbiting Partnership (Suomi NPP). The data for the image was acquired over 9 days in April 2012 and 13 days in October 2012. The 1.46 Gigapixel zoomable version shown here was realized by GigaPan online here. 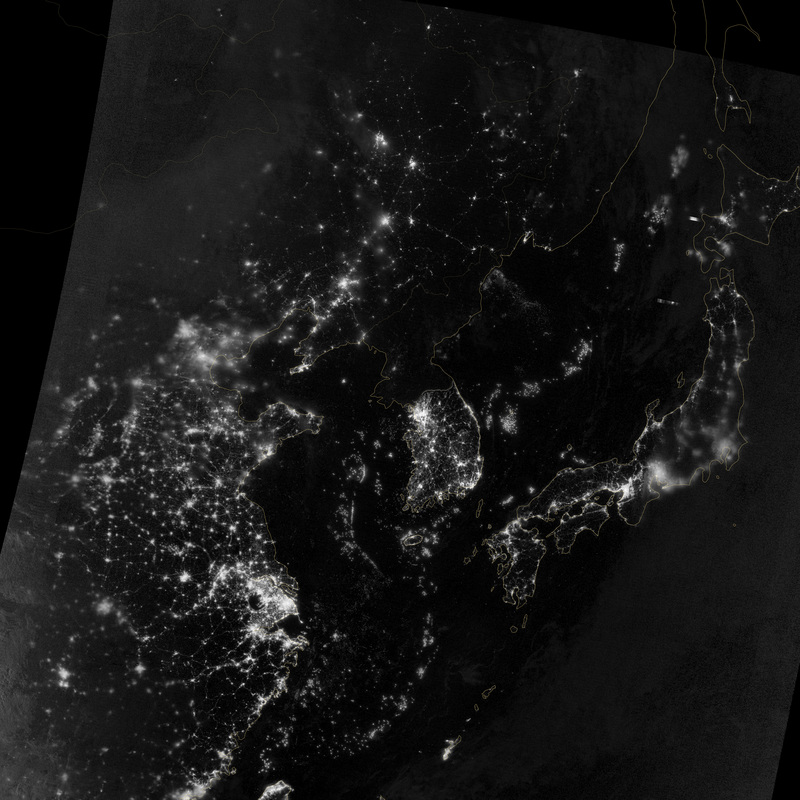 This composite image shows the Korean peninsula at night in 2012. It is taken by the National Aeronautics and Space Administration (NASA) and the National Oceanic and Atmospheric Administration (NOAA) Suomi National Polar-orbiting Partnership (NPP) satellite. My source is Wikipedia here. The original source is the NASA here. This file is in the public domain because it was solely created by NASA. The NASA copyright policy states that "NASA material is not protected by copyright unless noted".